The night before Redsfest was my company holiday party, and affair that notoriously extends into the wee hours, long after the bars are closed, usually ending up in one or more hotel rooms that have been reserved for this purpose by employees. The day of Redsfest was my son’s basketall team pictures, followed by a game. In the pre-Dusty Baker days we might have found the will to neglect our son’s budding sports career and hauled our hung-over selves 3 hours to Cincinnati, but this year it seemed like Redsfest would probably be OK on its own. And so it was, as indicated by this email, mysteriously missing a subject line, that I received from Michael Anderson, Public Relations Manager for the Reds. There were even photos attached, which is the first time I can ever remember the Reds–heck any MLB team–intentionally sharing media. The Christmas spirit must be alive and well. But don’t tell Selig. 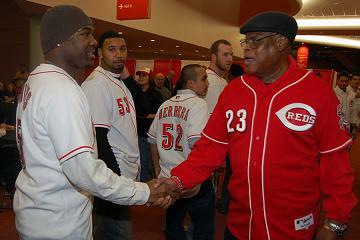 Though I am supposed to tell you that the photos are property of the Cincinnati Reds. 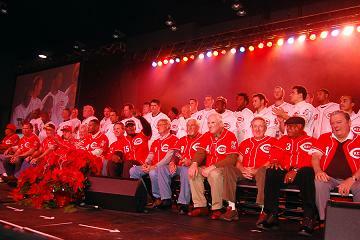 CINCINNATI (Dec. 18, 2008) — Kahnâ€™s Redsfest XI raised a record total of more than $100,000 for the Reds Community Fund. Proceeds from the annual fanfest, held Dec. 12-13 at the Duke Energy Convention Center, will help the Reds Community Fund continue its mission to connect kids and baseball. Since its inception in 2001, the nonprofit Reds Community Fund has used baseball as a vehicle to reach out to kids. Whether itâ€™s renovating baseball fields, providing opportunities to kids with disabilities, underwriting expenses for inner-city teams or hosting its â€œReds Rookie Success League,â€ the Community Fund is dedicated to improving the lives of youth through baseball. Also at Redsfest, the Reds Community Fund presented a check for $50,000 to the Cincinnati Public Schools that will help fund 11 inner-city high school varsity baseball programs along with field renovations at two of the schools and a commitment to add six junior high RBI baseball programs. Reds prospect Todd Frazier emerged from more than 530 poker players to win the third annual Reds Community Fund Celebrity Poker Tournament. Frazier was awarded the $10,000 guaranteed first prize and agreed to donate his winnings to the Reds Community Fund. Rich Standridge of Riverside, Ohio won the $5,000 second-place prize, and Angie Weiss of Augusta, Kentucky took home $3,500 for finishing third. Another Reds player, pitcher Daniel Ray Herrera, finished 6th in the poker tournament and donated his $2,000 prize to the Reds Community Fund. In addition to winning the poker tournament, Frazier also won the Redsfest XI Wiffleball Home Run Contest. Heather Roush of Delhi Township, Ohio and Brandon Weiss of Vandalia, Ohio tied for first place in the Reds Idol karaoke contest. â€œ3 Up 3 Downâ€ won the Redsfest Wiffleball tournament. 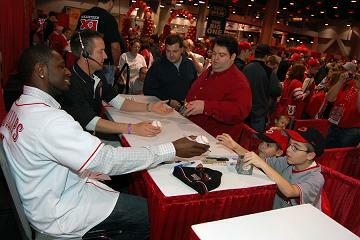 Two-day attendance for Redsfest XI was 17,038. Posted in Cincinnati Reds, Random Ramblings.